This is a brief overview of the various laws for each state concerning Bail Enforcement, Bounty Hunters, Fugitive Apprehension and Bail Bondsman. This is not legal advice. Laws change frequently, please check each state as there are links provided for possible updates and current information. Provisions of the Uniform Criminal Extradition Act applies to all of the following except Missouri and South Carolina. Also, keep in mind that the arrest of a principal by a surety is always for purposes of surrendering him back to judicial authorities. In addition, the states use different terminology for the same thing, for example, bail, surety, bondsman, and bail bond agent mean the same thing. Defendant means the same thing as the accused or the principal. 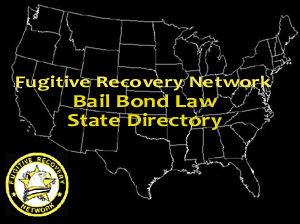 Bounty hunters are also called bail fugitive recovery agents, bail recovery agents, etc. Also please note that many states require those performing the apprehension to be in possession of a certified copy of the undertaking. The purpose of this is twofold (1) to show they have the authority to arrest the defendant, and (2) the judicial or law enforcement officers to whom the defendant is surrendered will require it in order to protect them from a charge of false imprisonment. AL Alabama gives wide latitude to bondsmen to arrest their principals. (Code of Alabama 15-13-62) The bondsman can authorize another to apprehend the fugitive by endorsing a certified copy of the undertaking (15-13-117). The bondsman or his agent can pursue the principal anywhere in the state, must possess a certified copy of the bond, must clearly identify himself and his purpose, and can enter a dwelling for this purpose. The principal has to be surrendered to the sheriff of the county of jurisdiction. (15-13-63). An out of state bondsman shall have a certified copy of the undertaking when apprehending the principal (15-13-124). UCEA H 593 would prohibit fugitive recovery near a school or child care facility. CT License required. Before apprehending a principal, a professional bondsman (licensed under CT Special and Public Acts, Ch 533), a surety bond agent (licensed under Ch 700f) or a bail enforcement agent (licensed under CGSA Sec 29-152 (f) to (l)) must notify law enforcement of the jurisdiction in which the principal is thought to be (29-152(k)). Under (Sec 29-152 (f) to (l)) bail recovery personnel are not allowed to wear law enforcement-like apparel or badges (29-152(l)), and if firearms are carried a permit is required (29-152(m)). License requires training (20 hours) and background checks. No felony record allowed. Police officers are forbidden from being bounty hunters. Violation is punished by a fine not over $1,000 and/or two years in jail and permanent loss of license (29-152(n)).UCEA H 5726. Clarifies licensing standards, conduct provisions, etc. DE A surety can apprehend and surrender his principal. (X. General provisions. Rule 46.) UCEA H 176 requires bail enforcement agents to have a license & register with Department of Public Safety. KY Bounty hunters banned. No bail bondsman or his agent can arrest, detain, and remove from the state a bail fugitive unless a warrant has been issued for the defendant (KRS 440.270(2)). To get the warrant, a “credible” person has to appear before a judge, the judge has to issue it, and the arrest must be made by a peace officer. Defendant then answers the charge before a judge in the county in which he was arrested (KRS 440.270(1). Kentucky expressly outlaws the commercial bail bond industry. KRS 431.510 (outlawing commercial bail bond industry); See Stephens v Bonding Assoc. Of Kentucky, 538 S. W.2nd 580 (Ky 1976) (upholding statute).UCEA. MA The surety to whose exclusive custody the principal is released has legal control over the principal to ensure his appearance. (MGL Ch 276, Sec. 58, Sec. 68, & Sec. 69) The surety can forcibly enter the dwelling of the principal to apprehend him. (Ch 276, Sec. 68) UCEA H 1481 Bail recovery agents must register with Department of Public Safety prior to a recovery. MD The surety can surrender the principal. (Rule 4-217, Section (h)(2) and (I)(3)(Annotated Code of MD, Art. 41, Ch.2) UCEA H 912 would require licensing for recovery agents. MO The surety or any person authorized by him may with a copy of the recognizance apprehend the principal in any county of the state. (MRS Title 37, Ch. 544.600) UCEA does not apply in Missouri. S 246 (Sec. 374.782 to 374.789) Bill regulating licensing of bail recovery agents. NH Recovery agents must be trained and certified through a program approved by the Professional Bail Agents of the US, and register with the Secretary of State who will issue proof of registration. Bail agency must have at least $300,000 in liability insurance for recovery activities, and recovery agents acting as independent contractors must have liability of insurance of at least $300,000. A surety or bail fugitive recovery agent must notify local law enforcement of the jurisdiction in which the recovery is to be made. (NRS 597:7-b) UCEA H 657 Prohibits convicted felons from being a recovery agents. NY At any time a surety may take a principal into custody at any place in the state and by written authority on a certified copy of the bail bond may empower any person over 20 to do so. (Crim. Proc. Title P, Div, 3, art. 530.80 & 540) UCEA A 1432 (enacted 21 NOV 00)and S 4719 Provide for licensing of bail enforcement. SC Free lance bounty hunters banned. The surety may at any time and place arrest the principal, or by written authority of a certified copy of the undertaking, empower anyone of suitable age and discretion to do so. (South Carolina Code of laws, Civil Remedies and Procedures 15-17-740) ((Insurance) 38-53-50 & 60) UCEA does not apply in South Carolina. TN A bounty hunter cannot have a criminal record, must notify the local police of defendant’s location, and present to the police a copy of the warrant, a copy of the bond, and evidence that the bounty hunter has been hired by the bond agent. (TC 40-11-3). The surety may arrest the defendant on a certified copy of the undertaking in any place in the state and by written authority on such a copy empower another to make the arrest (TC 40-11-133) The surety is also entitled to the assistance of the sheriff of any county to make the arrest. The certified copy of the undertaking must be exhibited to the principal upon arrest. (40-11-134) UCEA S 221 Bondsman liable for damage if address is wrong. TX The surety can apprehend and surrender the accused at any time. (TS 17.16 (282)(330)(318) also the surety can obtain a warrant to arrest the principal which warrant can be acted upon by a peace officer, security officer, or private investigator licensed in Texas (17.19). A judicial warrant is required to arrest with force (TS 17.19 [Vernon 1977]); see Austin v State 541 S.W.2d 162 (Tex. Cr. App. 1976). UCEA H 1848 Only a licensed PI or the bail bond surety can do recovery work. VA A surety may at any time arrest his principal and surrender him to the court in question. (Code of Virginia 19.2-149) UCEA H 582/H 2569. Regulates bail fugitive recovery. Licensing of bail bond agents. (18.185) UCEA H1482. Similar to CA requirements.